Here is the first of what I hope are many, many more Grocery Bags in 2018. It never seems to get old making these bags. It definitely helps that they are endlessly useful and so quick to make. Adding some variety by making patchwork ones and divided ones also keeps it interesting for me. This year I'd also like to make at least one that either incorporates paper piecing or applique. These are the two ideas I haven't quite gotten to trying out yet. 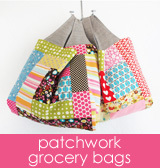 Leave a comment if you have some variations you use for these bags, or if you've already tried paper piecing or applique. 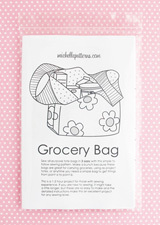 I'd love to see how you are putting your own spin on these super simple to make bags! This one here is made from this cotton canvas fabric called Khokhloma. This print is from the Indie Folk collection by Bari J. for Art Gallery Fabrics. There are two colorways available--Gloom or Burgundia--and it comes in canvas, quilting cotton, or knit. I used the canvas to make two of these bags. One has sold, but the other is available here. Both bags are sold, but check this section for new ones. The fabric is an easy to wash and sew weight of canvas--in other words, it's not stiff. It has a loose weave compared to quilting cotton, so in addition to the straight stitched seams, I zigzagged the edges. That might be overkill, but my sewing intuition told me to do it and I listen when the sewing intuition gives me instructions! The remnants left over from making the two bags can also be found here. 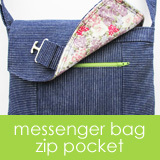 They'd make nice zipper pouches, but the largest remnant piece included is big enough for a clutch or other smaller bag.